Proctor360 is a Title III - Regulation Crowdfunding Campaign and is actively accepting investments. Learning and testing go hand in hand; knowledge is verified through testing and is a crucial part of education. In recent years the education field has been growing, especially online education which has gained tremendous traction due to its convenience. Similar to online education, remote (independent of location) testing, its counterpart has also been a growing market. Online proctoring/invigilation is increasingly being used in education and workforce certification throughout the world. It offers students and professionals the option to take tests remotely in a comfortable environment of their choosing. However, there are still many unanswered questions related to exam security, fairness, and content protection due to the lack of comprehensiveness and advance technologies. Current web based technologies just can't provide the required authentication and fairness due to weaknesses in remote test delivery. In a recent study 33% of students admitted to cheating on online exams. There are many companies and colleges that are apprehensive about moving to online testing due to its limitations. For that reason, we developed Proctor360 - a service that introduces revolutionary tech to the remote testing market. Our unique headset with a mounted 360° camera is able to get a full view of the testing space, it also includes a mic and speaker for communication. We see what the test taker sees, hear what they hear, and know what they touch; we are able to cover all bases with our system. This technology coupled with our trained proctors allows us to be the most comprehensive and fair option on the market. The remote proctoring market hasn't changed for 10 years. By using the same single camera technology, test takers have adapted to exploit a system with a limited field of view. There is a need for new tech that can supplement this. 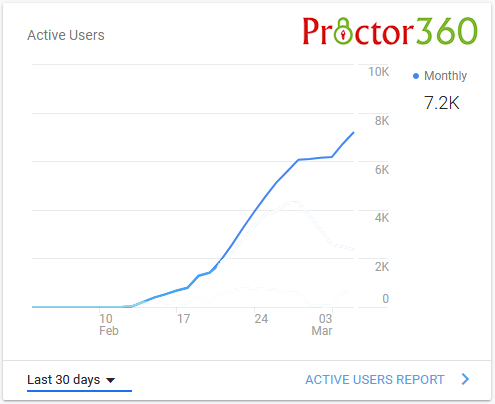 Thus, the market potential for Proctor360 is huge. Remote testing is estimated to grow to a $10 Billion global industry by 2026 and we plan to play a role! We believe the Proctor 360 to be the first of its kind - The most comprehensive and secure remote testing option on the market. Proctor360 is a service that allows test takers to take any exam from the convenience of their home or office while preventing any chance of cheating or content theft. Our patent pending headset uses a 360° camera to gain a complete view of the testing space. The headset consists of the 360° camera, a mic to enable listening of the space, and a speaker to communicate with the tester. This coupled with a computer camera and lockout web browser allows us to get multiple angles of the testing environment. -All data is fed Live to our proctors and is Recorded for future audit! Our certified proctors are trained to thoroughly monitor the environment and lookout for cheating behavior. $2 / share of Class B Common Stock│When you invest you are betting the company’s future equity value will exceed $1.3M. We offer a range of options to our customers and are able to provide a variety of security services based on their needs. Any of the security levels can be used for Web Based, Paper Based, or Hybrid Exams. Level 1-High Security uses the Proctor360 headset to monitor exams live, this allows the proctor to intervene if any cheating occurs and immediately end the exam. Level 2-Medium Security uses the headset to record exams for later review, a proctor will watch the footage at a later time and verify no cheating has occurred. Level 3 & 4-Low Security uses just the computer webcam. This option is available for testing that may not need high security. The live and auto proctoring options are available for low security as well. All exams are recorded, this includes: the 360° view, front facing view, screen capture, and sound from the microphone for future audit if necessary. We expect most of our customers to use High or Medium Security for their proctoring needs. The Low Security option is what's currently available on the market, we include this to be a single solution for all proctoring needs. We are able to offer more options to our customers and compete in the market. The cost of taking an exam ranges between $15 to $35, we expect an average revenue of $25 per exam. The cost varies depending on the length and security needed. Contracts with partners who offer a higher volume of users may be allowed volume discounts. An average customer life span is between 1 to 4 years; this mainly includes college students. Professional certifications often expire after a period of time and require recertification, making these customers return to Proctor360 for as long as 10 years. In our base year of commercialization, 2019, Proctor360 will have three streams of revenue flowing directly from remote proctoring. As the graph of our growth projections indicates, these categories of services, low security, medium security and high security, will shift over time as we gain customers and the industry transition of exams reserved for test centers are able to move to remote testing. We plan to scale and add two additional streams of revenue through our channel partners in 2020 and beyond. At present, 2019 is forecasted to generate a revenue of about 2 Mil with a Test Volume of 96,000 tests at an average revenue of $25/test. The Global E-Learning market is a $91 Billion industry, this includes education as well as all forms of testing. The Global Computer based Testing Market is a $42 Billion industry, this includes remote testing as well as testing done in testing centers. With our secure and comprehensive system, we are able to tap into this $42 Billion market. Companies and universities still use testing centers because current remote testing options are not secure, Proctor360 solves this problem and is able to transition tests taken in test centers to being remote, making even high stakes testing available anywhere at any time. The driving force behind this is not only convenience and comfort but also an estimated 25% savings on overall cost when using remote testing. The US alone has a $60 Million market for remote testing; the number of students taking online courses reported going up to 6 Million in just 2016. We are able to tap into that by giving companies and universities a more secure option that prevents their students from cheating and puts everyone on an equal playing field by promoting fairness. What is the expected growth of Online Proctoring / Remote invigilation market? How does this Disrupt a Traditional Industry? Proctor360 provides a Technological Breakthrough that Enables Secure, Fair and Affordable Remote Proctoring Services to your home, office or any other place of your choice. Based on our research, the Proctor360 is the first of its kind to provide a totally secure remote testing solution. After 10 years of the same technology, test takers are savvy enough to set up their environment to exploit single cameras with less than a 170° view. Proctor360 is able to supplement that gap by using its novel mounted 360° camera headset. The market for eLearning is growing. The growth of online colleges and degrees available over the past 10 years is exponential. More employers are requiring certifications for the workplace. So, as eLearning grows and the workplace demands more certifications, so must its counter-part, testing. Students and Professionals will no longer have to travel and take exams in uncomfortable environments, Proctor360 lets you test at home for greater professional development. Our goal is to target partners that can benefit from using the Proctor360 system. Our partners are divided into two groups: Channel and Direct. Channel Partners are companies where our headset compliments software they have developed. This includes mainly professional certification exams where high security is needed and the tests have complex questions. Most of these exams are limited to testing centers but want to transition into remote testing due to savings on cost; up-till now there was concern due to a lack of security in remote testing but through Proctor360 the option is now available. Direct Partners include schools and companies where we are able to use standard software to monitor testing. They service primarily online students who have to travel to testing centers regularly to take their exams. Now they can truly be remote with this technology. Currently, we use targeted email blasts with a feedback system that lets us know who is interested in our service. We contact them to schedule a demo, here we show them how our service can benefit their organization. To effectively show how our service is the most comprehensive and fair we plan to hire an outside firm to compare and test all forms of online proctoring on the market. We believe this would show customers how and where other companies fail to provide security and that we are able to do it better. This data will motivate schools to switch to a more secure option that can accommodate various levels of security and is the most fair for their students. Eventually we plan to develop our own platform software, this will cut down cost as we will no longer be dependent on a third party provider. We also plan to integrate A.I. in our developed software to auto-recognize cheating behavior. The idea for this company was created in May 2018; in a short period of time we have accomplished a lot. The founders of the company have worked in the proctored testing field for many years; by running/working at testing centers for 8 years we were able to see the direction proctored testing is going as well as establish the required contacts. The connections made through the years have aided in expediting the process and allowed us to get in contact with big players. So far we have designed a final version of the headset. We have gone through multiple iterations and currently have working prototypes. We have applied for a patent and the device is patent pending. The founders of the company currently own the patent and plan to transfer it over to Proctor360 Inc. We have tested our device with the software platform and show that they work together. We are pre-production but will be ready soon. We have talked to various companies and colleges who work in the testing field and do online testing. They see the value in our service and are interested in using it once we have scaled. Our executive board and advisory board has been established, it includes people extremely experienced in testing and business. Currently, we are in the negotiation process with ProV to license the headset for their testing needs. The next step for Proctor360 is to scale up and hire people who can help in growing the business. Our team consists of experienced individuals who have worked in the proctoring industry for years and/or have developed businesses in the past. With over 50 years of combined experience, we are able to make the decisions necessary to effectively impact the market. We see the advantages and the opportune timing of Proctor360 being introduced as a modern solution to remote testing. By building a strong coalition of certified proctors, promoting the security of 360° surveillance, and relying on the deep and broad experience of each member of our team, we are confident that we can disrupt the testing industry with our technology. Proctor360 Inc. will offer 10% additional bonus shares for all investments that are committed, within 24 hours of this offering going live, by StartEngine Crowdfunding Inc. shareholders who invested over $1,000 in the StartEngine Reg A offering which closed earlier this year. StartEngine shareholders who invested $1,000 or more in that StartEngine Reg A offering will receive a 10% bonus on this offering within a 24-hour window of this offering’s launch date. This means you will receive a bonus for any shares you purchase. For example, if you buy 100 shares of Class B Common Stock at $2.00 / share, you will receive 110 Class B Common Stock, meaning you'll own 110 shares for $200. Fractional shares will not be distributed and share bonuses will be determined by rounding down to the nearest whole share. Do you want to be a game-changer? Just FIVE DAYS remain to invest. There are just 5 days left before our OPO closes, and we're excited to see even more followers and investments in these final days. With analysts predicting that our patent-pending technology could capture a substantial portion of the multi-billion dollar testing market, our investors can count themselves part of an exclusive group of visionaries who will be able to say they recognized the potential of Proctor360 early on. When you recognize a potential game-changer, you often only have one opportunity to get on board, and the time is now. Why is Proctor360 is a smart investment? If you're looking for a game-changer, you need to be looking for a product that utilizes new technology to solve a real problem in its market. Proctor360's remote testing platform not only prevents cheating in online exams but will make online testing available for the kinds of tests that normally must be taken in a live center. Training and higher education institutions are desperate for a platform that can do this. An innovative product is only valuable if the market for that product is large enough for its success to bring substantial revenue. Computer-based testing is a 42 billion dollar market, and the growth of that market centers on remote testing solutions. The team has the experience to succeed. Proctor360's founders are veterans of the computer-based testing market with experience operating live testing centers and successfully launching online testing platforms. A track record of success is the reassurance that a company has the skills to bring the product to market. Don't forget to watch our final live webcast on YouTube this Saturday as we discuss plans for launching our platform and answer any questions interested investors may have via the live chat! 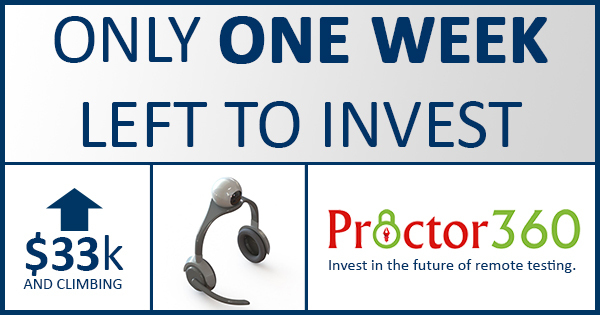 As we enter the final week, new investors are still discovering Proctor360! Our Maximum Raise is only $107k for this offering. We believe the best way to deliver value to our shareholders is to only take on as much investment as we need at each stage. That means less dilution of share value as compared to a company seeking the SEC maximum of $1,070,000 right at the beginning. When we get to our next funding round, our shareholders are more likely to see their shares increase in value. Our founders have a successful track record. This can't be overlooked. The CEO has been operating live testing centers for over 15 years, and our COO founded and successfully exited ProctorU - another major company in this industry. Our corporate leadership knows the testing industry and how to make this new platform a success. We have a clear path to early revenue. When you invest in a startup, you want to be able to see some kind of early traction, because it's a key metric for measuring a company's potential to get to market and succeed. Not all startups have a clear plan for earning revenue early on. Proctor360 does. There are companies waiting for our product to become available right now, and the only question is how quickly we can scale to meet their needs. We'll be hosting one final live webcast this Saturday to talk about our next steps as we prepare to launch our remote testing platform, and we'll be answering your questions via Youtube's live chat as well. If you haven't made the decision to invest yet, this will be one last chance to ask our founders any questions you may have. One final week to invest. Don't miss out. We're down to the final week of our Online Public Offering! If you've already made your investment, we want to thank you and formally welcome you to the next stage of our journey as we begin putting our production order together for our patent-pending 360° headsets. Our new online testing platform will herald a major leap forward for the industry, and only you will be able to lay claim to having the vision to make that early investment once we've achieved our next milestone. Have you told your friends about your decision to invest? Don't keep it a secret. Every additional investor we receive in this offering represents additional support and influence as we continue with our plans for growth and success in the next stages. 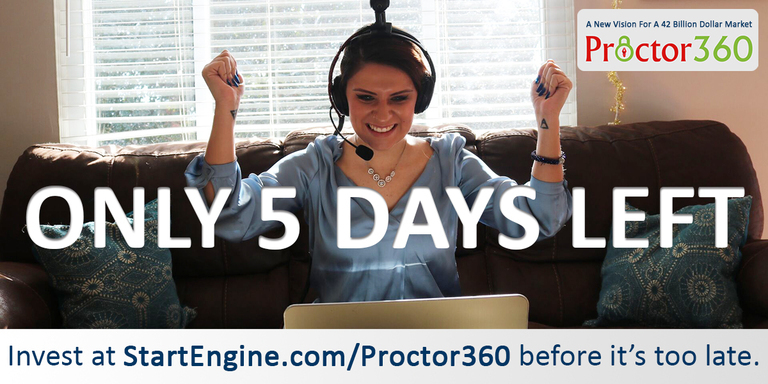 There isn't much time, so make sure you share the link to our StartEngine campaign with your connections and tell them why you think Proctor360 has such amazing potential. Time is running out. We've already raised more than three times our minimum goal to support our manufacturing efforts, and we will turn our full attention to bringing this product to market once this offering is over. If you're still not sure, look through our campaign updates and see all of the positive mentions we've received from industry experts. Go back and listen to the recordings of our live webcasts on Youtube. And if you still have questions, please post them in the comments section of our campaign page-- we'll be happy to answer them for the benefit of every interested investor. Don't forget - we're going live on Facebook Thursday at 6:00 PM Eastern! Remember to join us on Facebook Live on Thursday, April 18th at 6:00 PM Eastern Time! 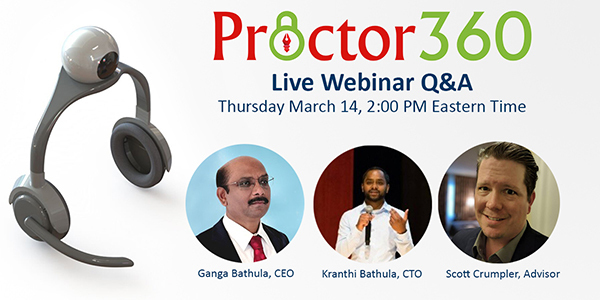 The Proctor360 team will be broadcasting live on Facebook to discuss "Problems and Solutions In Testing For E-Learners" and answer YOUR questions about the company, their plan for initial growth, and this Online Public Offering. Click the icon above or follow us on Facebook to be notified when we go live. 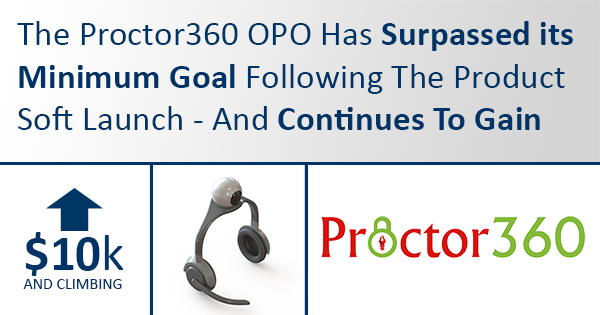 Did you know that Proctor360 has gained more than 40 new investors in this OPO? That's right - the investor market is responding to our patented 360° testing platform as the industry begins to see the incredible potential for our product to solve critical problems in computer-based testing. It's a 42 billion dollar market that has been seeking immediate solutions to support its explosive growth, and only new systems that can provide convenience, cost-savings, and protection against cheating will meet that need. Proctor360 has already tripled its minimum fundraising goal, and there are only a couple of weeks remaining to make an investment. Watch us live. Ask us anything. And take advantage of this offering while it's still active. As interest in Proctor360 continues to grow, we're frequently asked about the kinds of challenges facing E-Learners when it comes to testing. If you've never had to take a proctored exam for professional certification or an online class, you might not realize how this area of education technology is lagging. So for our next live session, we'll be covering the problems with testing for both the students and the learning institutions that require exams. Take some time this Thursday, April 18th at 6:00 PM Eastern to watch on Facebook Live and ask us questions directly about our technology, our plans for growth, and this Online Public Offering! Follow Proctor360 on Facebook or click the link below to be notified. Click here to be notified on Facebook when we go live! Proctor360 Featured As A Leading Technology Solution in 2019! Nothing says more about a startup's chances of success than recognition and praise from experts in the industry. Proctor360 is generating A LOT of buzz in the world of online testing, and Learning Light's recent article covering 2019 E-Learning Trends and Leading Technology Solutions once again validates all of our hard work to bring this product to market. They've featured us as a leading solution for Online Proctoring in 2019 and even said, "this could be an interesting opportunity for investing in the growth of this area of elearning." We've continued to see more investors come aboard to invest in what we see as a major leap forward for a large market with amazing growth prospects. There are only a couple of weeks left in our OPO, and we are not planning to extend it. So you need to act soon if you want to participate in Proctor360's success. We are going to launch this product, and you don't want to miss the opportunity to see the kind of rewards that can only come from investing in a company at an early stage. If you live in the Washington DC area, we encourage you to attend our live session tomorrow from 6:00 PM - 8:00 PM. 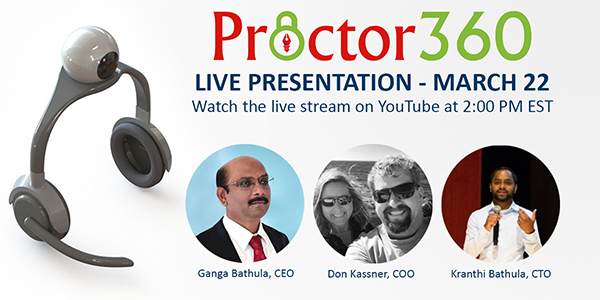 If you are thinking about investing in Proctor360, this is the perfect opportunity to see a demonstration of the platform with your own eyes and meet the founders. 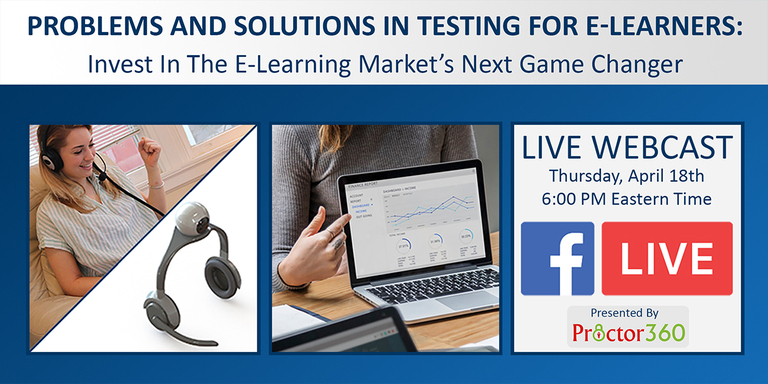 We'll be discussing our patent-pending technology and how it will change the remote testing market by preventing cheating in online exams. We'll also discuss our Online Public Offering and this opportunity to invest. Our campaign is gaining momentum! Crowditz, a website that tracks the performance of active Title III offerings, has listed Proctor360 as a "Momentum Leader" with relative fundraising increase landing us in the Top 5 percent of all OPO's for the past week! This is excellent news and we see it as an incredible validation of our product and this investment opportunity. 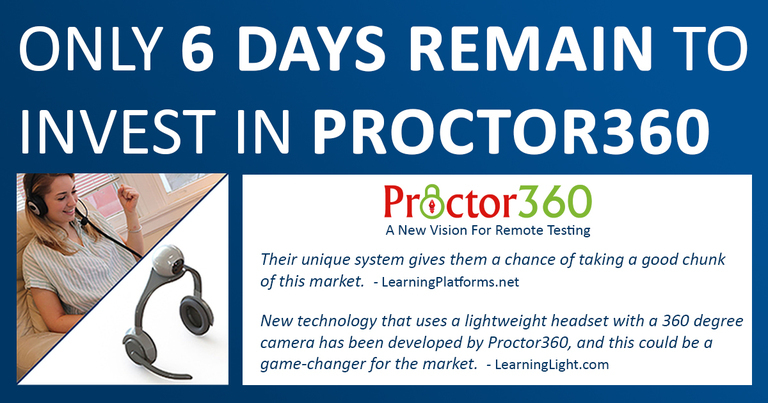 If you haven't made your investment in Proctor360 yet, time is running out. Don't miss out-- join us as an investor and share in our future success! Proctor360 is on the rise! Join us live at 4:00 PM Eastern Time today. Proctor360 is on the rise as new investors come aboard daily! We've been seeing a lot of new investment over the past week, and it's a testament to all of the positive attention we've received about our 360° remote testing technology. Today we'll be discussing that technology and how it prevents cheating in online tests when we go live at 4:00 PM Eastern Time. If you've made your investment, tell a friend. Think about it. If you see the value of our technology and the potential for your investment to soar in value, then don't keep it a secret. Share your vision with your friends, family, and colleagues and tell them why you think Proctor360 is a great startup. Tell them to check out our live webcast today at https://proctor360.com/live so they can hear our pitch and ask questions. To us, investing in startups is about more than just investor dollars -- it's about showing early support for a company you believe in! Spread the word while there is still time - our Online Public Offering will be closing soon! In today's live chat we talked a lot about the challenges to the proctored testing market as more and more cheating is being discovered and threatening the credibility of exams for college entrance, for E-Learning, and for professional certification. And, of course, we discussed how our product is going to change all that as we move toward initial revenue and the full launch of our 360° testing platform. We got some great questions in the live chat from interested investors, and we're continuing to see growing enthusiasm from potential customers. If you haven't made your investment in Proctor360 yet, it's time to start getting serious. We're gaining momentum and looking forward to bringing this game-changing product to a 42 billion dollar market! In keeping with our commitment to remain engaged with our followers and investors throughout this offering and beyond, we will be holding our next live webinar on Thursday, April 4th at 2:00 PM Eastern Time. This presentation will stream live on YouTube and give new followers and interested investors an opportunity to hear more about the product we're launching and the remote testing market. No registration is necessary. Simply click below on April 4th at 2:00 PM Eastern Time, and you'll be redirected to the YouTube live stream where you can watch, listen, and post your questions in the chat. As the number of followers to our StartEngine offering has nearly doubled since February, we've decided to extend the offering period for our campaign an additional 30 days. We've received a great deal of interest from potential investors over the past couple of weeks, and some have expressed the need for additional time to make their investment. This is a one-time extension, and we encourage anyone wishing to make their investment to take the opportunity in these final days. Proctor360 has received sufficient investment to launch our product. Our offering has been structured to reflect our plans for an initial manufacturing order for our patented headsets. Once we surpassed our minimum goal, we secured enough investment for a minimum production order, and this product will launch. We've capped our maximum investment goal at $107,000 and any additional investment up to that amount will only help to ensure faster growth to meet the needs of the customers we have waiting for this product. Currently, we have 4 companies waiting for our product that reflect a potential test volume of 3,000 - 6,000 tests per month. We project that will result in $75,000 - $150,000 in monthly revenue. And that's just the beginning. These are companies that have seen the demonstration of our platform with our prototypes and are waiting for our product to be ready to ship. We continue to field new inquiries from learning and training institutions every week. Investing in this offering is not a question of potential market value. It's about investing in the supply to a waiting audience of customers. We formed Proctor360 to bring our product to the remote testing market because, as professionals in this industry, we know how cheating threatens the credibility and fairness of online testing. We developed the concept for our 360° testing platform and designed the headset prototypes before starting this campaign because it's a product the industry needs in order to ensure that eLearning students can take crucial exams the same way they receive their training-- online. It's a multi-billion dollar industry that is threatened by cheating and scamming. As we've seen with the FBI's recent "Operation Varsity Blues", even live testing centers are vulnerable to fraud and cheaters. This is not just a threat to the business of testing; it's a serious threat to honest students and professionals who need to take certified exams to enhance their lives, to gain access to higher education, and to advance their careers. And that's why our team is working to bring this product to market. With the help of investors like you, we can achieve faster growth and see positive change sooner. Investing in Proctor360 is not just a good investment decision. It's a way to change the game in a positive way for an important industry, and we want you to be a part of that. LearningPlatforms.net recently reviewed our technology as a part of their overview of online assessment platforms in 2019, and they were very impressed. Read the article here. According to their analyst, Proctor360 could capture a significant market share and "could well bring further growth to this market." As more and more industry experts discover Proctor360, we continue to generate buzz and market confidence. The article even went on to comment about this investment offering, saying, "...this could be an interesting opportunity for investors looking to enter this high-growth, high-potential area of the elearning market." Make your investment while there is still time. Our tracking shows that many investors have begun the process of declaring the amount of shares they want to purchase but haven't yet completed the final checkout. We're glad to see those numbers, but it's important to complete your investment while there is still time. If you've been considering making an investment, the time is now. Don't miss out on the opportunity to be a part of our future success. Investing in startups is all about having the vision to see the potential for growth, but that means taking action. As a follower of our campaign, we know you can see the potential. All that's left is for you to seize the opportunity while you can. We will be conducting another live webinar on Tuesday, March 26 at 2:00 PM Eastern Time. Click the link below to be redirected to the live stream on Youtube at 2:00 PM EST. We'll be continuing these live webinar events to allow interested investors and potential customers to learn more about our product and this investment offering. Click here to watch the live webinar at 2:00 PM EST. We're happy to see new investors coming on board over the weekend as we continue to hear from industry professionals about the amazing potential of our product for the remote testing market. If you haven't made your investment yet, the time is now. Our company is preparing to begin actively seeking clients for our secure 360° remote testing platform, and we're pleased to be a startup with a product that is ready to generate revenue in the near term. If you can see the value of this product, don't miss out on this opportunity to invest! We plan to stay engaged with you and to make ourselves available to answer any questions you may have right up to the close of the offering and beyond. With that in mind, we will be conducting another live webinar on Tuesday, March 26 at 2:00 PM Eastern Time. This product is going to launch soon, and we want you on board to share in our success. 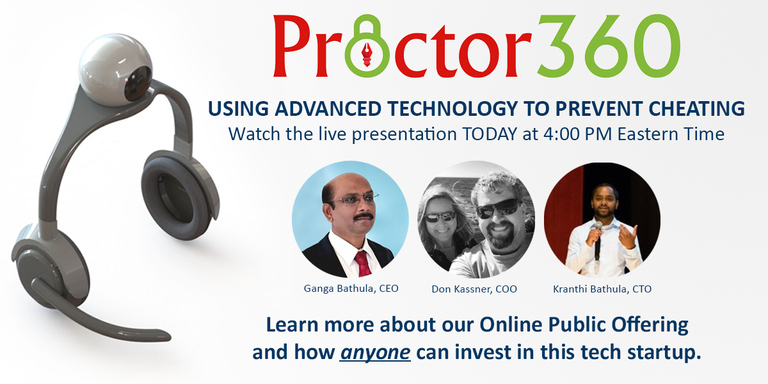 Don Kassner, our COO and the former founder of ProctorU, recently returned from ATP's "Innovations In Testing" conference, and he reported back that there was a great deal of interest in Proctor360 and that many attendees felt this is the next direction for the remote testing market. Time is running out to invest. Take action soon. We've garnered a lot of interest in this offering, and you may have noticed that we are not currently seeking the maximum $1,070,000 allowed for a Title III. That's because we are about more than chasing investor dollars. We are industry veterans who know our product is the next leap forward for remote testing. And we also know that the time to roll this product out is now. We've done the hard work of developing the product, designing the prototypes, and demonstrating viability. Our StartEngine campaign is about making this opportunity available to investors who want to support a project with real revenue potential and share in our future success. Our tracking and our communication with many of our prospective investors has revealed that many shares amounts have been declared and many are planning to complete their investment as the offering close approaches. That gives us a measure of confidence in how the campaign is performing, but we do feel obliged to encourage you not to wait too long. If you want on board, you have to take action. And we hope very much that you do. We've had a busy week as we field more and more requests to demo our platform for potential education and training institutions! And our COO, Don Kassner, has just returned from ATP's "Innovations In Testing" conference where interest in Proctor360's forthcoming product was high. With that in mind, we'll be conducting another live presentation tomorrow (Friday, March 22) at 2:00 PM Eastern Time. NO REGISTRATION NECESSARY. Simply click the link below, and you will be redirected to a YouTube live stream where you can watch, listen, and post questions in the live chat. As you might know, Proctor360 has exceeded its minimum funding goal. When a company reaches its minimum on StartEngine, it's about to begin withdrawing funds. If you invested in Proctor360 be on the lookout for an email that describes more about the disbursement process. We've had a surprising number of prospective investors tune into our previous live events-- so many that some were not able to get into the Webex conference to listen in! With that in mind, we'll be conducting another live presentation tomorrow (Thursday, March 14) at 2:00 PM Eastern Time. The FBI's recent announcement that they've stopped an elaborate scheme in which exam administrators and proctors aided college candidates in cheating the SAT's and ACT's is a tremendous validation of our technology and highlights the need for solutions like ours in this multi-billion dollar industry. We'll be touching on this subject in our live webinar on Thursday, but you can also read our press release for our official commentary. Investors in Proctor360 are getting in on the ground floor of a company that is ready to meet the needs of this multi-billion dollar industry. Our first milestone is achieved as we surpass our minimum goal! Following the soft launch of our patented technology, we're excited to announce that we've officially surpassed the $10,000 mark in shares sold! We've only just begun to roll out messaging about this Online Public Offering, and this critical milestone means that our funding round will be successfully closed regardless of the final total shares sold. We want to thank all our investors, partners, and associates who believe in our project and made their investment so early. Your confidence and early investment give our OPO the momentum to seek more investors and make the most of the entire offering period. We've had several thousand visitors to the campaign page so far and received wonderful feedback on the potential for our product in the multi-billion dollar remote testing market. Over the next few days and weeks we will be reaching out to larger and larger audiences to introduce them to our investment opportunity, so keep coming back to see how our campaign grows. If you've made your investment in Proctor360, share your enthusiasm for this opportunity while it's still active. Last Thursday, we held our Soft Launch event to demonstrate our technology to industry partners, potential customers, and to interested investors. It was well attended, and we garnered a lot of interest in the future of this product! Take some time during your lunch break to attend and hear more about our company and our product. If you missed our Soft Launch make sure to come to the Webinar we are hosting this Tuesday at 12:00 PM EST. The Proctor360 Soft Launch Is TODAY! The soft launch event is expected to last from 12:00 PM to 2:00 PM Eastern time. Tune in by clicking the link above to watch the live demonstration of our patent-pending product along with a discussion of the remote testing market and our current Title III Investment Offering. 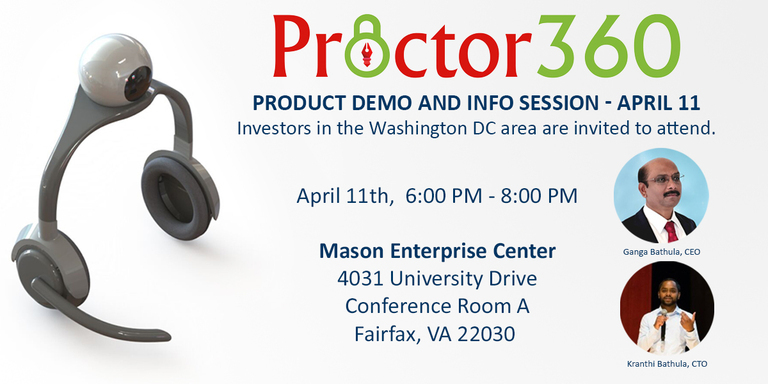 Richmond, VA – Tech startup Proctor360 will conduct a live demonstration of their patent-pending technology for industry partners, potential customers, and interested investors at 12:00 PM EST on February 28, 2019 in a soft launch event. The presentation will be held at the Mason Enterprise Center in Fairfax, VA and will be live streamed online. Their product consists of a uniquely designed headset which incorporates a 360° camera, speaker, and microphone to provide remote test proctors with a complete view of the testing environment during online exams. It works in conjunction with their software platform which the company’s proctors use to monitor and record all inputs and archive them for future review. Current remote proctoring services only use standard webcams, which provide too narrow a field of view to completely guard against cheating, and this means that most professional certification exams and crucial academic tests still require E-Learning students to travel to a live testing center in order to take these kinds of tests. Proctor360’s new product will provide the total reliability of secure, live proctoring with the cost-savings and convenience of online testing. Bathula knows the industry well as he currently operates two live testing centers in the Washington, D.C. area, and he has partnered with successful proctoring tech entrepreneur Don Kassner, who has enjoyed success in the remote testing industry having founded other successful startups. Kassner is COO of Proctor360. Learning Light, a leader in eLearning strategy, featured Proctor360 in an article this week covering cutting edge companies in the Online Proctoring segment, and they've singled us out as a "game-changer" in the market! Learning Light consults for organizations to implement best-practice eLearning systems, and they recognize the value of our product and technology to the marketplace. As we approach the soft launch of our product, they've taken the extraordinary step of including Proctor360 in their list of Top Online Proctoring Services worldwide. "The global computer based assessment market is worth an estimated $42 billion. It is forecast to grow very strongly due to the increasing internationalisation of education, increasing MOOC usage, and the demand for certification and regular re-certification from an increasing number of professionals." "We see remote invigilation – live, online identification and monitoring of the candidate taking an exam – as the next step for computer based assessment. Both in terms of technology and convenience, we believe this $42 billion market is ready to be tapped by remote invigilation." "New technology that uses a lightweight headset with a 360 degree camera has been developed by Proctor360, and this could be a game-changer for the market. The headset can be mailed out to learners for their examinations, then returned for refurbishment and mailing out to the next student. " What does this mean to our investors? It means you're not alone in recognizing the potential value of our product to the market. Industry experts see our technology as a major leap forward, and we see recognition like this as a real validation of the investment you make in Proctor360. Scott Crumpler has joined the remote testing tech company Proctor360 as an advisor as they begin seeking investment for their 360° online test proctoring technology. Scott’s twenty year career as a marketing professional has spanned multiple roles helping companies to develop successful strategies at various stages. 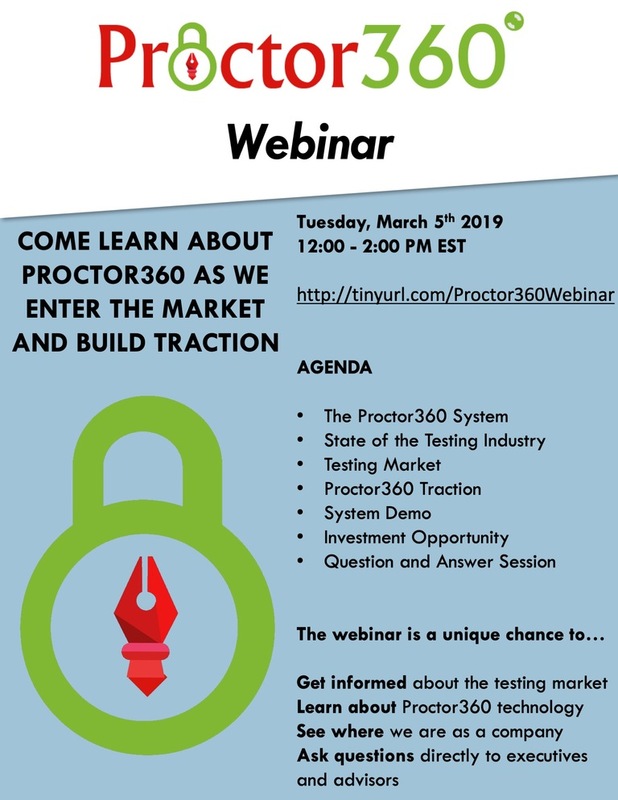 As Proctor360 prepares to launch their patent pending hardware for secure online testing, Scott Crumpler will advise them on funding strategy and initial market penetration. During the soft launch we will be speaking about the current limitations in testing and show colleges and companies how they can use our system to deliver their exams. This is a great way for us to reach a large audience and bring on partners to work with us. Proctor360 Pitch Demo Completed Successfully! If you missed our demo you can watch the video (about 6 minutes) here. Encourage your friends/families to support us with our investment campaign! We are happy to announce that we'll be participating in StartEngine's first Demo Day of 2019, this Friday, January 25th! We'd love for you to join and learn more about our company.Come support us at 10:40 AM EST/7.40 AM PST, and follow us on StartEngine for further updates! Be part of an innovation in technology where college students and the workforce can take their exams directly from home. Proctor360 uses a patented headset with a mounted 360° camera to make this possible. Now students can take Computer based, Paper based and even Hybrid exams directly from home. Click to Join Demo Day and Ask Any Question. We’re proud to be a part of this revolutionary technology and provide a secure online solution for home/office exam delivery through the Proctor360 system. We invite you to learn more about our campaign here. You’ll find information on our business, growth plan, financials, investor benefits, and much more. 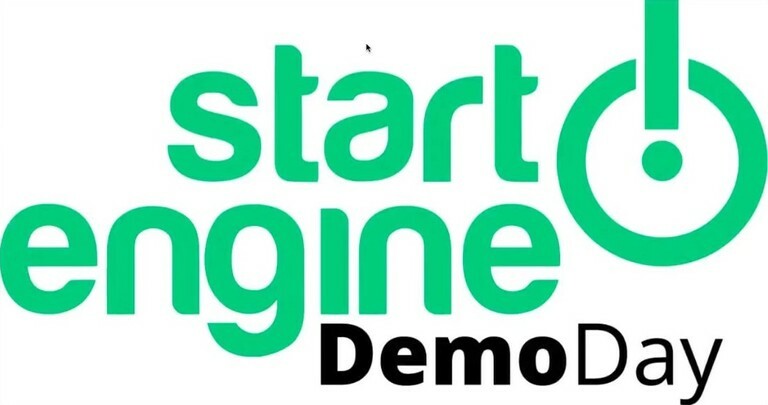 This Friday (Jan 25th) we are participating in StartEngine’s January Demo Day. We will be presenting about problems in current testing and how Proctor360 is the most comprehensive solution. We encourage anyone who has invested or is interested in investing to participate. Tell your friends and family so they have an opportunity to be a part of Proctor360! Join us at: https://startengineinfo.typeform.com/to/AExx3A at 10:40 AM EST/7:40 AM PST for our pitch. This Friday (Jan 25th) we are participating in StartEngine’s January Demo Day. We will be presenting about problems in current testing and how Proctor360 is the most comprehensive solution. We encourage anyone who has invested or is interested in investing to participate. Tell your friends and family so they have an opportunity to be a part of Proctor360. We will post about a specific time when we get closer to the 25th. Hope everyone had a good week, we definitely did! In the past week we have ramped up our marketing efforts to drive more people to this page and invest in Proctor360. We are using Constant Contacts, LinkedIn and Facebook for much of our marketing. We’ve gained a substantial amount of traffic to our company page on all platforms. Throughout the week we have continued to make sales calls, give demos and stir up interest for our service and tech. Today we are having a board meeting where we will discuss approval for use by the NCCA-ICE accreditation organization, this would authorize us to work with various companies restricted to just testing centers. This is going to give a lot of students a better option! Thank you to everyone who has invested! Within a few days we have neared our minimum goal. We are continuing to work with our team to bring on new investors. Currently, we are planning our soft launch at the end of January, we will exhibit our company live in Fairfax, VA and over social media platforms so everyone can view its application and potential. Using targeted campaigns, we are inviting potential customers and interested parties to this event. Once again, thanks for checking out our page and considering our offering. We encourage everyone to share this page and let their friends and family know, so they can own a part of Proctor360 and help change proctored testing for the better.